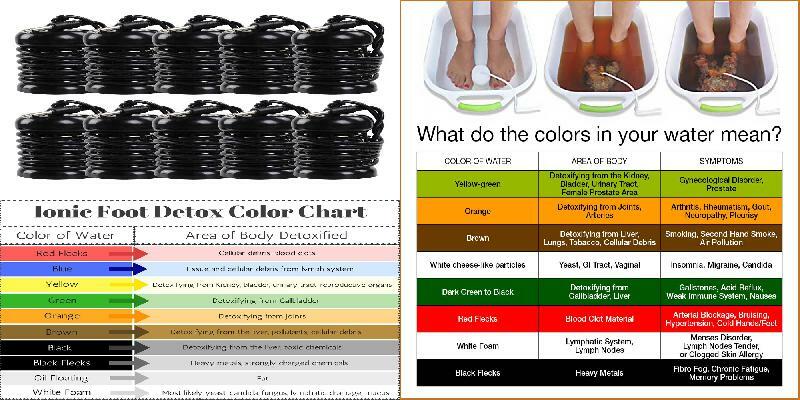 What the mean of the foot detox water color? the body has the ability to get rid of toxins from polluted air, water and junk food by means of exhalation, perspiration & excretion. the problem comes when the rate of toxin intake exceeds the body’s natural ability to get rid of them. you start to feel drained & exhausted without any apparent reason. this is the body’s message that something is wrong and needs your attention. an ionic foot detox provides a safe, & effective way of quickly releasing large amounts of toxins from the body, without fasting or taking medications & will quickly renew your vitality and ability to cope with daily stress. but the real benefits have much more to do with human bionergetics. 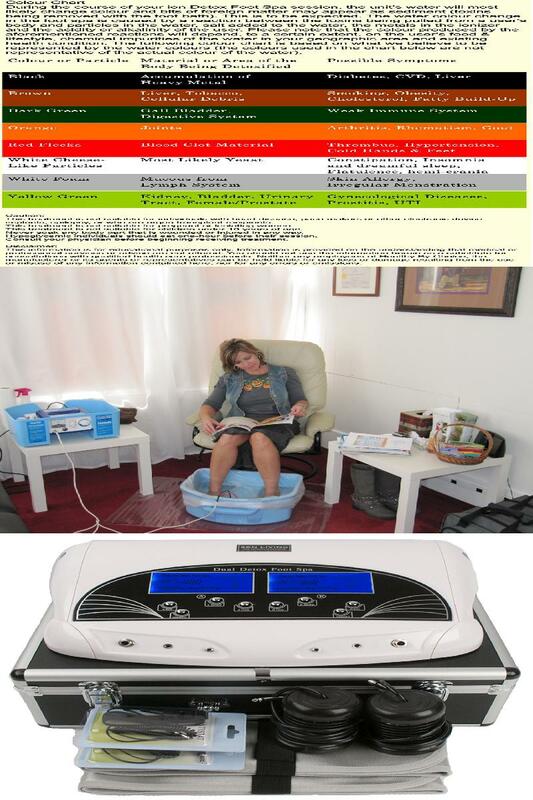 direct and facilitated detoxification pale in comparison to the widespread health benefits of ionic foot detox machines. You may have seen pictures similar to the above. Many manufacturers and practitioners claim that it removes toxic matter in the body by soaking your feet in an aqua tub. The treatment is normally given by soaking your feet in water with salt added to aid the conductivity of the water. Then, low electrical current is transmitted through two electrodes. Here’s what really happens. The color of water changes due to a process called “electrolysis”. The brown toxins you see are from the rust generated by the corrosion of the iron electrodes! The different variations in color can be accounted by varying amount of salt added to the water and variations in the compositions of the electrodes. The color of water will change with or without soaking your feet in it. 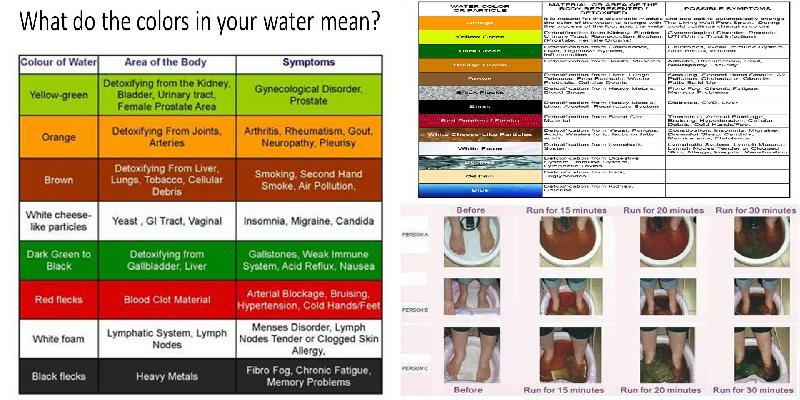 Dialysis results from several sources also show that the brown stuff that appears in the bathwater is iron-based, and that the bathwater showed no sign of urea or creatinine, supporting the fact that detoxification does not apply. In fact, some marketers admitted this and opted in emphasizing “energy balance” in their sales pitches. They also use pseudoscience of toxins, bio-energy, bio-stimulation, cellular energy, and other science jargons to mislead people. 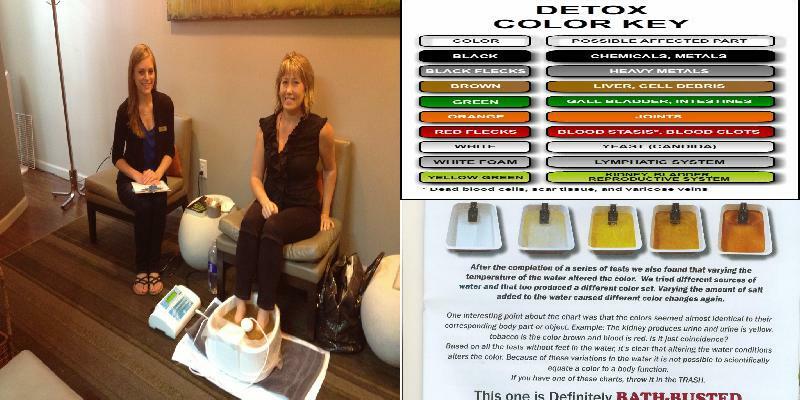 Also, among many commercialized detox foot spa machines, they claim that their machines create negative ions in the water that revitalize the dead cells and organs in the body. There is no definite proof that water can be ionized properly. Ionized water may supposedly mean that the water is ionized, although it is unclear what this claim means precisely. It is claimed that water in an electric field will self-ionize. Pure water at room temperature and normal pressure always self-ionizes to 10–14 M, and it is impossible to force the water permanently into a higher state of ionization without adding other chemicals. However, even if it is possible to ionize the water, it is difficult to prove it. How Do I Dispose of the Discolored Water? It’s perfectly safe to flush the water from the tub down the toilet, just as you would with regular tap water that you might be trying to dispose of.